Add your Manta Sightings to Manta Matcher. Marine scientist, Dr. Andrea Marshall, first identified the existence of oceanic manta rays. Dr. Marshall is based on Mozambique but her work with manta rays is global. There are two key areas in Asia that have been important for her research, specifically Black Rock in Myanmar and Indonesia’s Raja Ampat region. The Manta Ray Cleaning Stations of Black Rock. Black Rock is one of Dr. Marshall’s favourite places to interact with giant manta rays. Her team has been working in Black Rock with mantas for the past six years and as a result of their great encounters, they have started a branch of the Marine Megafauna Foundation in South East Asia with an emphasis on Thailand and Myanmar. An assigned scientist regularly visits the area to investigate megafauna, as well as sightings along the coast line of Thailand and Myanmar. Black Rock is one of the great locations where manta rays aggregate, coming together in large numbers to clean. Manta rays have everything from parasites to shark bite marks to entanglement injuries that they got cleaned by tiny little cleaner fish that host them. Data Collection is Key for Learning About International Migrations. Black Rock is host to many different cleaning stations. So divers go there to identify the mantas in order to look at their range. One of the most incredible finding from data collected at Black Rock is that not only do the same mantas appear, but those same mantas are seen up in places like Thailand. This has demonstrated the first international migrations of mantas in Southeast Asia. Thailand and Myanmar share a population of mantas and the more the team learns about them, the more it is evident that the connectivity is a frequent occurrence with mantas going back and forth across the border on a regular basis. Lack of Conservation In Other Areas Have Affected Manta Populations in Thailand. Manta rays are a very important tourism species in Thailand with a lot of people coming from around the world to dive with them. Myanmar doesn’t have a lot of marine conservation in place at the moment and there are fisheries even for mantas in some parts of the coast of Myanmar. Dr. Marshall’s team are very concerned that the reduction in numbers in Thailand is maybe fuelled from other places like Myanmar or the Andaman Islands. That is one of the reasons that they go out repeatedly to figure out what is going on so that they can help with conservation initiatives in the area. The Giant Mantas Display International Migration Patterns. Satellites telemetry is still cutting edge and expensive technology, so Dr. Marshall’s team have deployed dozens of tags on mantas around the world to track migrations. Overtime, data started to pick up the longest migrations being tracked. To date, the longest ever recorded is in Ecuador. One of the things noted about these giant mantas found in Black Rock and along the coast of Thailand and Myanmar, is that those are the migratory species. The reef manta, which are the ones that you find in other parts of Southeast Asia like Raja Ampat, are less migratory. In an archipelagic nation like Indonesia, they do move in between the different islands but bigger international migrations are not often seen from these reef mantas. So it’s the giant mantas that are the ones that go on long migrations and that are also the very deep divers. Efforts to Protect the Manta Population in Ecuador is Paramount. The Marine Megafauna Foundation is an organization that I co-founded is to save ocean giants from extinction. They work mostly in developing nations that lack capacity to look after their ocean giants. There was a big fishery for mantas and sharks located in Ecuador. They have since protected their mantas in 2010, but they are still being caught in Peru. Dr. Marshall and her team are researching the world’s largest population of giant mantas in Ecuador and they have identified that as a global hotspot with the largest population on record at the moment. So it’s important for them to protect that very critical habitat. Manta Rays Are Navigating Fisheries Between Protected Waters. Southeast Asia is home to the biggest fisheries in the world for mantas and so we’re trying to figure out connectivity, where they are, how close they are to fisheries and what we can do about it. Research showed that manta rays in Indonesia were traveling in between the protected areas of Komodo National Park, Nusa Penida in Bali, the Gili Islands in Lombok. Unfortunately, the biggest fisheries for mantas in Indonesia are located in between those protected areas. So it is almost like they are running the gauntlet from one protected area to another through this large fishing area. Indonesia was prompted to declare all of their waters protected for mantas because they realized what they were doing wasn’t sufficient. Mitigating Over-Diving To Preserve Manta Cleaning Stations. One thing that is very important to Dr. Marshall is making sure that certain sites, especially critical habitats, are not being taken advantage of or getting over-dived. When people locate a special area like Black Rock, the tendency is to visit it frequently. There are now a lot of the new liveaboard dive boats putting it on their roster for where to go when they are in the Mergui Archipelago. The best way to prevent over-diving is to have different boats and go out to different dive site areas so that there is a reduced impact on any one location. Dr. Marshall’s team is doing a lot of exploratory diving in the region, using the satellite tacking to look at where the mantas may be going and overlaying the information. Manta Matcher Connecting Lives Around the World. Manta Matcher is a global ID database for manta rays. Dr. Marshall and her team were able to develop an algorithm that works just like the FBI fingerprint database. So divers can upload a manta ray and the technology checks the identification against every manta registered in the database around the world, instantaneously. When divers see a manta, they can take a photo, upload it, and it can tell you whether or not that manta has been sighted in Thailand or Myanmar before, or anywhere else in the world. What’s so great about Manta Matcher is that it gets people engaged with the research because your name then gets tied to that manta and anytime that manta is sighted again, you get an update. So different people around the world are starting to connect with the lives of mantas and with each other. Citizen Scientists Getting Involved In Manta Research. [0:00:06.2] CM: Hello and welcome to Dive Happy, the podcast about the best places to go scuba diving in Asia. I’m your host, Chris Mitchell and my guest for this episode is marine scientist, Dr. Andrea Marshall, who first identified the existence of oceanic manta rays. [00:00:36.4] CM: So Dr. Marshall, can you tell is what is so special about Black Rock? [00:00:41.2] AM: Absolutely Chris. I’m really excited to be able to have the opportunity to work in Myanmar and the Mergui Archipelago. Black Rock still rates as one of my top 10 dives of all time and it’s certainly one of my favorite places to interact with giant manta rays. My team and I actually have been working in Black Rock with mantas for the past six years and as a result of our great encounters there, we have actually started a branch of the Marine Megafauna Foundation in South East Asia with an emphasis on Thailand and Myanmar. So we do have a scientist going over regularly investigating megafauna, actually sightings along the coast line of Thailand and Myanmar. Black Rock seems to be one of the great locations where manta rays aggregate, and by that I mean they come together in large numbers specifically at that area to clean. So manta rays have everything from parasites to shark bite marks to entanglement injuries that they got cleaned by tiny little cleaner fish that host them. It’s almost like a little manta ray hospital and Black Rock has a ton of different cleaning stations around it. So our divers go there and what we’re after is ID’ing the mantas so that we can look at their range and one of the most incredible things about what we’re finding at Black Rock is that not only do we see the same mantas again but we also see those same mantas popping up in places like Thailand. So it has demonstrated some of the first international, actually the first international migrations of mantas in Southeast Asia. We now know that Thailand and Myanmar share a population of mantas and the more we’re learning about them, the more we’re seeing that it’s really regular connectivity with mantas going back and forth across the border on a regular basis. How that’s important for conservation? Well, manta rays are a very important tourism species in Thailand with a lot of people coming from around the world to dive with them and as I’m sure you’re aware, Myanmar doesn’t have a lot of marine conservation in place at the moment and there’s fisheries even for mantas in some of the parts of the coast of Myanmar. So we are very concern that the reduction in numbers in Thailand is maybe fuelled from other places like Myanmar or the Andaman Islands. That’s one of the reasons that we go out repeatedly trying to figure out what’s going on so that we can help with conservation initiatives in the area. [00:03:03.1] AM: Yeah well that’s a bit of a secret. I have kind of just told you that really for the first time. [00:03:06.9] CM: Awesome, it’s a Dive Happy exclusive. So yes, that was going to bring me to a follow up question. You know that a few years ago they finally figured out the great whites are actually moving from New Zealand to South Africa and these voyages of thousands of miles. So what’s the extent of how far you’ve seen mantas moving? Is the Thailand-Myanmar kind of the furthest you’ve manage to track a specific manta ray? [00:03:27.9] AM: No, it’s not the furthest that we’ve tracked, but that type of research is in its infancy. All of the satellites telemetry is still cutting edge and it’s very expensive so we have deployed dozens and dozens of tags on mantas around the world, but not every single manta ray goes in an international migration. But we have overtime started to pick up these longest migrations. I think the longest one we’ve ever recorded to date is in Ecuador where we also have a project and one of the things that we do note about these giant mantas that you get in Black Rock and along the coast of Thailand and Myanmar is that those are the migratory species. The reef manta, which are the ones that you find in other parts of Southeast Asia like Raja Ampat where we also work, they’re less migratory. They do move especially in an archipelagic nation like Indonesia, they move in between the different islands, which is very interesting. But at the same time, we’re not seeing bigger international migrations from these reef mantas that often. So it’s the giant mantas that are the ones that go on long migrations and that they are also very deep divers. [00:04:31.0] CM: Fantastic. So just to digress for a moment, with your work in Ecuador, is that following similar patterns is what you are looking for in Burma and also in Mozambique or is it different? [00:04:41.8] AM: The mandate of the Marine Megafauna Foundation, which is an organization that I co-founded is to save ocean giants from extinction. So we really try and work mostly in developing nations that lack capacity to look after their ocean giants and we’re trying to ask different questions in different situations. So there was a massive fishery for mantas and lots of sharks and things in Ecuador. They have now since protected their mantas since 2010, but they’re still being caught in Peru and we are researching the world’s largest population of giant mantas in Ecuador. So the reason that we work there is because we’ve identified that as a global hotspot like the largest population on record at the moment. So it’s important for us to protect that very critical habitat. In Southeast Asia, we’re trying to answer different questions because of course in Southeast Asia we have the biggest fisheries in the world for mantas and so we’re trying to figure out connectivity, where they are, how close they are to fisheries and what we can do about it. You talked about our program in Indonesia, well a couple of years ago, I think it’s two years ago now we put out a paper showing that manta rays in Indonesia were traveling in between the protected areas. So Komodo National Park, Nusa Penida in Bali, the Gili Islands in Lombok, these are all protected areas for mantas and everybody thought, “Oh well the mantas are there and they’re protected so they’re okay.” Well our research was showing that they actually moved between those protected areas frequently and unfortunately in between those protected areas are the biggest fisheries for mantas in Indonesia. So it’s almost like they’re running the gauntlet from one protected area to another through this massive fishing area. That actually prompted Indonesia to declare all of their waters protected for mantas because they realized what they were doing wasn’t sufficient. So that’s what we’re after, in different locations we’re asking different questions so that we can figure out how to protect these animals. [00:06:32.3] CM: Right. Yeah that’s very interesting about Indonesia, like you say, they are running the gauntlet. There’s a lot of media coverage particularly if you’re interested in diving about for example shark finning and mantas being fished comes up a lot as well. 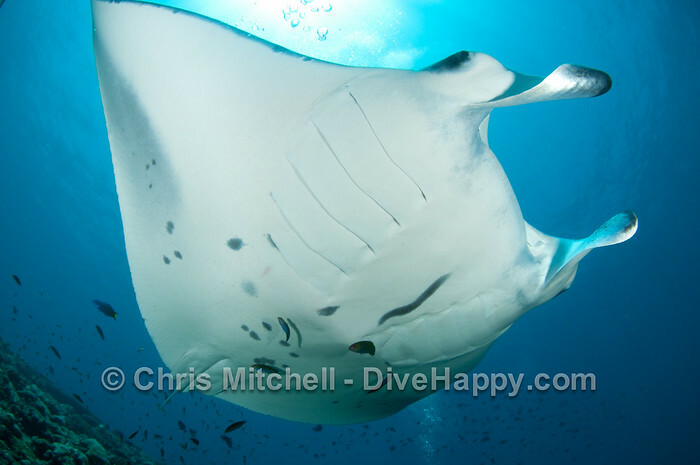 For example, if you follow on Facebook, you can see endless photos of mantas that have been hauled out of the water. Obviously, it’s very positive the way that all these new protected areas are coming in. Do you think it is actually combining together to have a real positive impact or is it a game of whack-a-mole all the time with dealing with the new areas that come at me and the fisherman would just move to a different area because they obviously have different life things that they have to support themselves? [0:07:12.7] AM: It’s a very complex question and I’m glad you asked it because I think a lot of people are asking the same question. Sometimes I think social media can be great in terms of educating people about the problem. When I first started investigating manta fisheries and doing public talks, nobody even knew that people would want to catch a manta. Also people get depressed, it seems like too big of a problem to do anything about. That’s not exactly true, it is true like you said that fishermen that are displaced, that are not allowed to fish in one location, often times move to another location and start to fish, that is a problem. But at the same time, people are seeing positive impacts in terms of shutting down manta fisheries in Ecuador as I was speaking before, it’s a great example. Where if you look at fisheries data, they were catching manta rays steadily and in 2010, protective legislation kicked in and mantas dropped off the radar. No one was fishing mantas, no one was pulling them up on the beaches anymore ever since then. So that nation has totally flipped in terms of fishing/conservation now and that shows you that conservation efforts can have an impact. In places like Indonesia, it’s more right now the case of shutting down some major known fisheries and people are saying, “Well the fishermen are just going to a different island and starting up the fisheries there.” Because it’s an archipelagic nation and it’s hard to keep track of where the fishermen go, that nation is going to be a little bit more difficult to deal with. That doesn’t mean we can’t tackle it, we just have to get smarter about it. [0:09:01.3] CM: Yeah, absolutely. Going back to Myanmar then, does it feel like essentially the research work that your foundation’s been doing up there, is it kind of almost like you’re the first people up there that are trying to take stock of what the situation is? Do you feel like you have a good grasp on the manta population in Myanmar and the impact that the fisheries are having or is it all still up in the air? [0:09:22.3] AM: No, we’re learning a lot. I feel so fortunate to have such an amazing network of people around the world that feed us and that’s one of the reasons why we are so effective. In Thailand/Myanmar we were contacted by these two, free loving dive guides, Rick Parker and Clive White, about seven years ago who had seen me on a documentary and said, “Hey, we have some mantas in Thailand,” which I had heard about but they didn’t seem like that many. So had it not been for that call, I may not have ever turned up and since then, we’ve started a pretty stable program for the mantas in that region and it turns out, I can tell you, the scientists that work for me that have been spending a lot of time over there, they have now been able to put the numbers together to demonstrate that this is one of the largest populations of giant mantas in the Indian Ocean. So they’re up to just under 300 ID’s of giant mantas in Thailand and up to 54 ID’s of Mantas in Myanmar. And giant mantas are actually quite rare and so in the Indian ocean, we really haven’t been able to document any very significant populations. This one is now standing out as the more we’re there, the more ID’s we’re getting and it looks actually like a very substantial population. So that’s information that no one really knew about and we’re bringing it to the forefront now. So I think yeah, the research there is on an upswing, getting a lot of momentum and now we have to figure out where the threats are to the animals in the region. [0:10:53.5] CM: Okay. Obviously, Black Rock’s very special to you, would you have an idea of an ideal liveaboard trip that would just to be to spend like five days at Black rock? [0:11:01.5] AM: No. I mean I think one of the things that we’re doing now is we are doing more exploratory trips to kind of try and discover other aggregation areas because just because we’ve identified Black Rock as an important area doesn’t mean they’re on to others. The other thing that’s very important to me actually is making sure that certain sites, especially critical habitats, aren’t getting over dived. So when people locate a special area like Black Rock, the tendency is to visit it frequently. 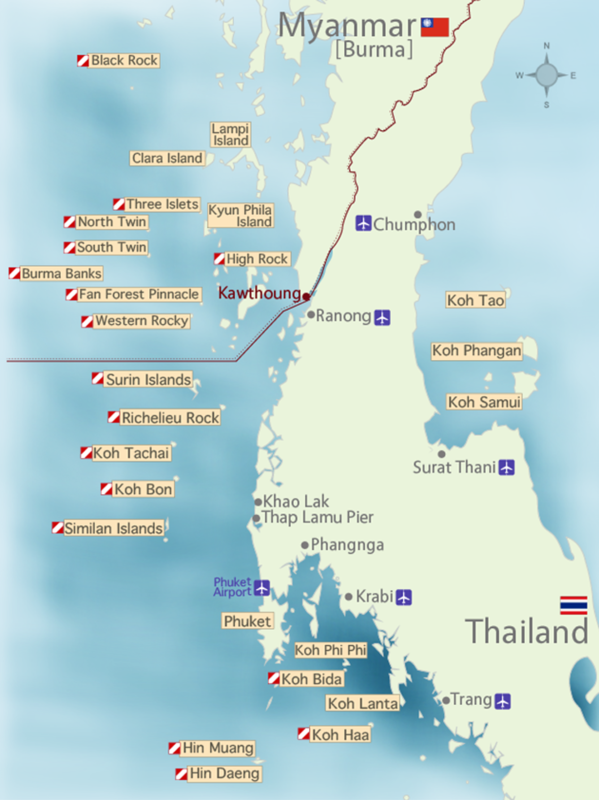 So we have a lot of the new liveaboard dive boats putting it on there, sort of roster for where to go and when they’re in the Mergui Archipelago. We don’t want to sort of serve the mantas at this critical habitat and make them leave. So one of the things that’s really helpful is to find other aggregations areas and then spared the impact out. So have different boats, go to different areas so there’s a reduced impact on any one location. We are doing a lot of exploratory diving in the region, using the satellite tacking tracks, to kind of look at where the mantas may be going and overlaying the information and then also for us, it’s about spending more time there but of course it’s so remote that very few people want to spend a lot of time out of that location. So one of the other things that we’re trying to do is get more support from people who have sailing yachts to see if they’re willing to support scientists to go out to those locations for like two, three weeks at a time. That’s one of the things we’re looking for at the moment and because there are so many private yachts in Thailand, we’re really hoping to find some support soon. [0:12:28.4] CM: Awesome. So what kind of work would they do when they get out there? Would it just be continuous diving and try to tag and map the location of mantas or just, like you said, the exploratory, trying to find new areas and see what’s there? [0:12:41.1] AM: I think both, I think the exploration is important but understanding what the mantas are doing at these critical habitats and where they’re coming from before they get there and where they go to after they leave are important. Then just being able to stockpile ID’s because when we go out to Black Rock for a couple of days, we’re able to gather dozens of ID’s but if we’re there for two weeks, we might be able to get hundreds and so it would really accelerate the pace of how we’re able to do the research if we were able to be on location more. So in Mozambique where I’m seating right now, we’ve been working on the Manta population for 14 years here but we dive every day. So that’s why this is one of the most comprehensive databases in the world. Black Rock is hard to access and so we don’t have the opportunity to dive there as frequently and thus it’s going to be slower. The more time we can get out there, the more support we can get from people. People uploading ID images when they go to Black Rock to Manta Matcher, which is the global ID database for mantas, the better. The faster we’re going to be able to move. [0:13:41.1] CM: Yeah, Mantamatcher.org is still playing a major part in this, is it? [0:13:44.5] AM: Major role. For me that’s, I think, my greatest contribution so far to manta research. I’m so proud of this database and the technology behind it, we were able to develop an algorithm that works just like the FBI fingerprint database. So you can upload a manta ray and it basically checks it against every register in that database in the world, instantaneously. So you see a manta, you take a photo, you upload it and it can tell you whether or not that manta’s been sighted in Thailand or Myanmar before or anywhere else in the world. What’s so great about Manta Matcher is that it gets people engaged with the research because your name then gets tied to that manta and anytime that manta is sighted again, you get an update. So different people around the world are starting to connect with the lives of mantas and with each other because you say, “Oh it was last seen, you know, I saw this manta in Myanmar but Joe Blow saw it in Thailand four months earlier,” and then they start communicating and it just builds this amazing network and gets people involved in the research and ultimately at the end of the day, that’s what it’s about. People getting involved and also feeling a rapport or a connection with these animals. [0:14:53.2] CM: Yeah, it is a fantastic tool and like you said, it’s great for lay people, for normal divers to be able to actually do something tangible, something physical to help. [0:14:24.2] CM: Right. It’s a black hole, isn’t it? [0:15:02.6] AM: Yeah, and a lot of people will do it but it doesn’t really connect them to the story or make them understand the bigger picture. So these types of programs like Manta Matcher which is a wild book so there’s a lot of different ones. There’s one for whale sharks, there’s one for humpback whales. It can connect people with a story and they can follow it over time, schools can adopt a manta and follow their manta through time. It’s just about getting people really involved in the process of science and connecting those researchers with the public, which is so important. [0:15:56.6] CM: Right. One of the things we talked about previously was not only are you dealing with all the data that’s coming in now and obviously sort of building these maps of how the mantas are living and existing in different places, but you talked about trying to figure out the future for manta rays, trying to figure out the patterns, obviously that your work is not just about the present is that you’re trying to think about the next 20, 30 years of how you protect and let the mantas thrive. Can you talk anymore about that, about what specifically you’ve got in mind to do that? [0:16:26.8] AM: Absolutely. I mean I’m working with a long term plan. I think one of our major achievements recently on 2013 was to get these animals listed on CITES, which is the Convention on International Trade In Endangered Species. It became very clear to me throughout the course of my work that manta rays were being obviously harvested for their body parts and as a result of their really conservative life histories, not having very many babies and not having big populations, that they were in real trouble. I spent really, me and my team and others around the world too, spent the last 10 years trying to capture the right type of information necessary to get them listed on the appendices of that treaty. So once that was achieved, we all breathed a sigh of relief and now we’re looking towards the next big step. That big step is to identify the most critical and priority regions or locations or aggregation sites in the world for mantas and getting protection for them first. They don’t distribute evenly across the world. Manta rays really prefer specific areas and if we can identify those really critical habitats then we can make that a priority for conservation and get protected areas set up in those locations. That’s why we work in Ecuador, really big important population, there’s others that are working in the Maldives, that’s why we’re trying to work in Thailand, Myanmar and also Raja Ampat where there’s a massive population too, and in Mozambique. So we really trying to identify these carriers now and try and get specific protections for the animals and those populations in those areas. [0:17:59.5] CM: Awesome. Okay, and when are you next due to come to Asia? [0:18:05.2] AM: We are due to come back to Thailand pretty much every year for about January to March, which is the manta season and so that’s when you’ll see our group next. We do have people based in Thailand that are helping us to do the work and gather ID’s but our research team from the Marine Megafauna Foundation goes out every year for those months. [0:18:22.9] CM: Are those trips open to the public or are they purely for scientists? [0:18:26.8] AM: No, we do have Ray of Hope Expeditions, which is one of my creative ways to get the public to interact with researchers. We do offer a couple of trips for them every year so people can go to Rayofhopeexpecditions.com and sign up for one. But we also are encouraging, what we’re doing is we’re actually training the dive guides on various liveaboards to give manta presentations and to tell people how to use Manta Matcher. So regardless of who you go with, you can still somehow get involved in the manta research, be a citizen scientists. But those that want to actually travel with our team and actually do some of the real science can join us easily through these Ray of Hope Expeditions. [0:19:03.0] CM: Awesome. Dr. Marshall, thank you so much for talking to us about this. [0:19:06.4] AM: It is a pleasure. [0:19:07.6] CM: Okay, thanks a lot.